This is a two-part journal assignment that my 9th grade students used during their study of To Kill A Mockingbird. 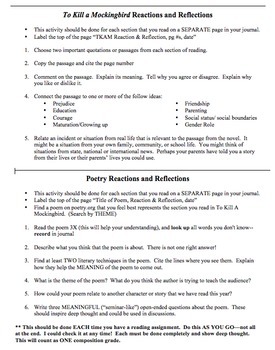 For part one, students write a detailed reflection on the assigned chapters that includes a personal reflection, summary, and connection to a theme. (I did not assign chapters on the sheet, so you can decide how quickly you would like your class to read). For part two, students choose a poem that best represents the theme of the section and connect the two. This required my students to use higher-order thinking skills and worked well to get discussions going on the reading.